Today is my one year blogoversary! To celebrate the occasion, I made Chocolate Éclairs. 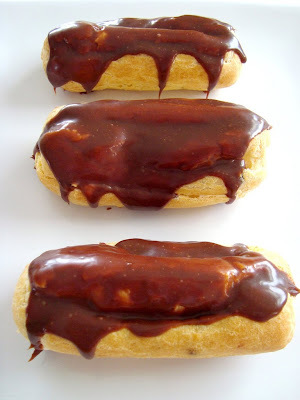 If you have been reading my blog for a while, you’ll remember that Chocolate Éclairs were once my page layout. 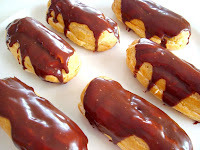 I made those éclairs before I started my blog, so I never had the chance to post the recipe. 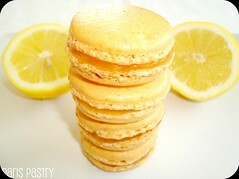 For my blogoversary, I wanted to make a French pastry, so these were perfect! 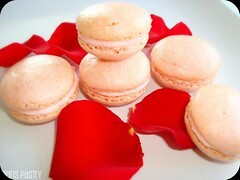 They’re not very hard to make, though they are time-consuming, but well worth it because they are A-M-A-Z-I-N-G! Rating: six 5 out of 5! - Preheat the oven to 425°F. Line two large baking sheets with parchment paper. With a ruler and a pencil, mark lines about 3 ½ inches long on the parchment, spacing them 1 ½ inches apart. Turn parchment over, marked side down. 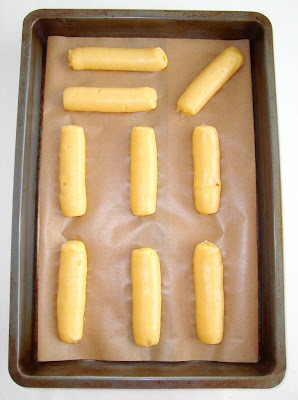 Fill pastry bag fitted with a ½-inch plain tip with Pâte à Choux; pipe along the lines on the prepared baking sheets. Gently smooth tops with a moistened fingertip to ensure even rising. - Bake for 10 minutes; reduce oven temperature to 350°F. 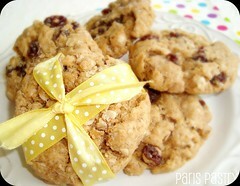 Continue to bake until pastries are golden brown, 25 to 30 minutes more. Transfer pastries and parchment to a wire rack to cool completely. 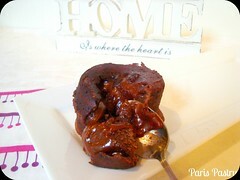 - Place chocolate in a medium heatproof bowl. Heat ¾ cup cream and corn syrup in a small saucepan over medium heat until bubbles begin to appear around the edges, about 5 minutes; pour mixture over chocolate. Let stand 5 minutes, then stir until smooth. Let cool, stirring occasionally, about 5 minutes. 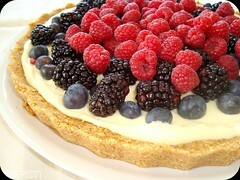 - In a medium bowl, stir the Pastry Cream to soften. 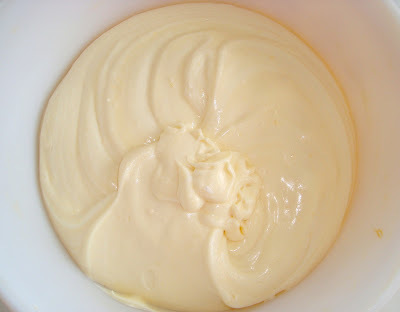 In another bowl, whip the remaining 1 ½ cups heavy cream to stiff peaks. 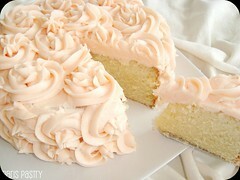 Fold the whipped cream into the Pastry Cream in two batches to lighten. 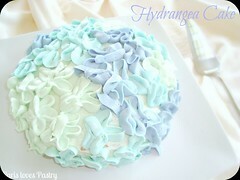 Transfer to a pastry bag fitted with a ¼-inch plain tip, and pipe to fill with the whipped Pastry Cream. 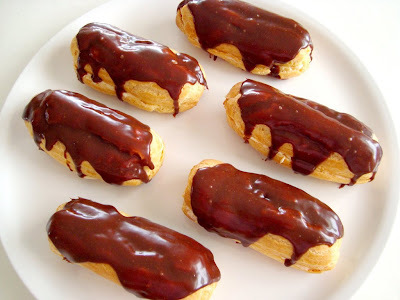 - Dip the top of each Éclair into the chocolate glaze; let excess drip off, and place, coated side up, on a wire rack set over a rimmed baking sheet. 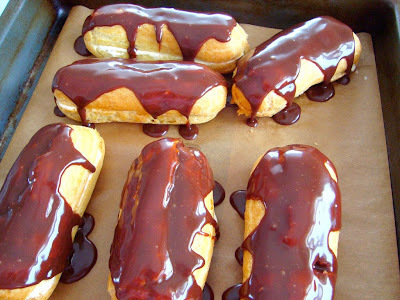 (I doll-upped the chocolate glaze with a teaspoon over the éclairs) Refrigerate Éclairs in a single layer in an airtight container until glaze is set, about 10 minutes or up to 1 day. 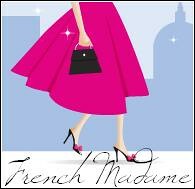 This is the banner I had on my page-layout throughout most of the year. I changed it to Ladurée's Religieuse à la Rose a couple of months ago. 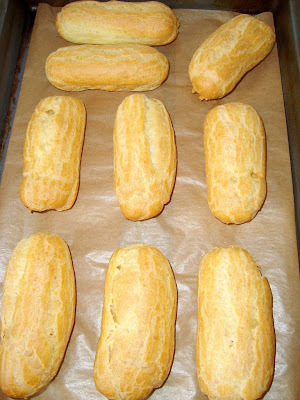 Pâte à Choux piped as éclairs. Baked: they look like mini-baguettes! 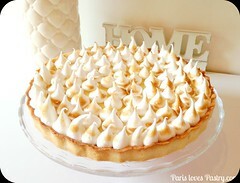 "The French traditionally fill their éclairs with pastry cream; the British prefer whipped cream. 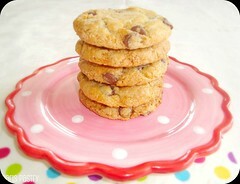 Our recipe borrows from both, for a filling that is at once rich and light." 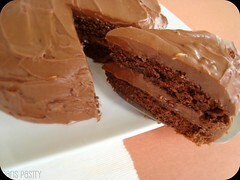 Topped with an over-the-top delicious chocolate ganache. Et voilá! My Blogoversary treat! The ones I baked today were much better than last years. I guess all that baking paid off! yummy yummy . these look delicious! Happy Blogoversary! 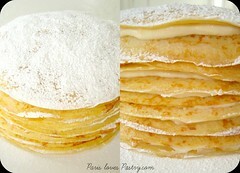 My husband adores these so I must make them for him soon. 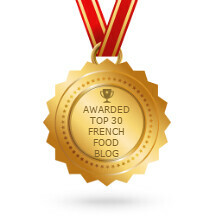 I'm falling in love with your blog.Congratulation guy. 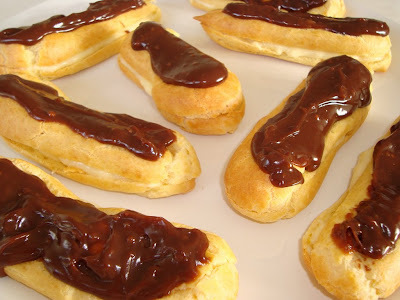 @little wisher: I believe I got 18 eclairs out of this recipe.